This image was selected by Buku to hang in their lobby. It captures their theme of 'Global Street Food'. It is a 30X40 inch photographic print, matted and framed to a 42X52 inches. 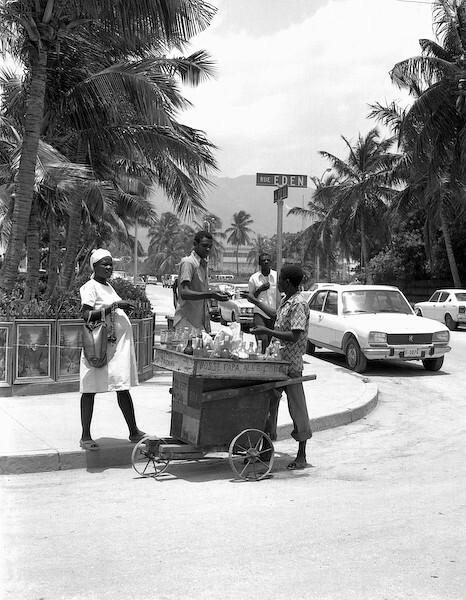 'Haitian Street Cart' was made in 1979 in Port au Prince, Haiti. I used a Mamiya 6X7cm medium format camera and Tri-X black and white film. This was really quite a colorful photo in that the bottles in the cart contained a broad assortment of brightly colored liquids which, on this hot summer day, look quite refreshing (as represented by the queue). I especially like the cart, basic but functional, made from scrap crates and lumber to transport this young man's means of earning an income. It works particularly well as a black and white image because the distractions of the surroundings are quieted and your attention is first drawn to the main theme, the transaction of the street vendor and his customer, and then gradually released to explore more and more of the moment and the surroundings.